The holiday season is officially here, which means it’s at least socially acceptable to start hanging your holiday outdoor lighting. If yours are already up and shining bright, we applaud your enthusiasm for this wonderful holiday month. If not, you’re in luck — we’re going to go over how to correctly install your holiday outdoor lighting on your Berlin home in this blog post. At Billows Lighting & Design, we believe it’s important to focus on your home’s outdoor lighting for more than just the holiday season. We’re the area’s largest lighting showroom, and we have a large selection of outdoor light fixtures in Berlin. If your home or office is in need of an outdoor lighting upgrade, schedule a consultation with one of our lighting experts today to see how we can help you achieve optimal lighting goals for your space. Continue reading below for our pro tips on correctly and efficiently installing the holiday outdoor lighting on your Berlin home. 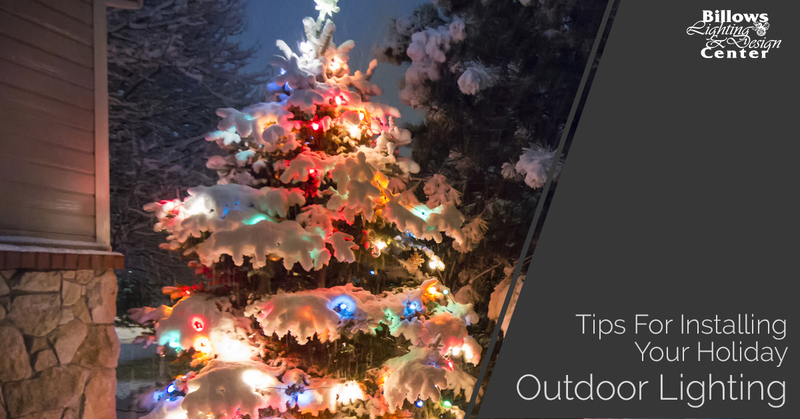 If you’ve had your holiday outdoor lighting for several years, this tip is one of the most important on this list. Wires can become brittle and more prone to damage as they age, and they also feel the effects of cold weather. These damages are essentially fire hazards and could be potentially dangerous to put on your home. Take the time to inspect your string light wires before hanging them, and if they’re broken, it’s worth the extra $10 to replace them. While you’re inspecting them, take this time to plug them in and ensure all the lights are working as they should be. As we mentioned above, we want you to have a happy and safe holiday, meaning you should take a cautious approach when it comes to hanging your holiday outdoor lighting. Try not to connect more than about five or six string lighting strands to a single circuit, and avoid pulling your outdoor lighting too tightly just to reach an outlet. Safety is the primary theme of this blog post. While you’re hanging your outdoor lights, be safe if you’re getting up high to hang them on your rooftop or other elevated areas. Ensure your ladder is sturdy and in solid condition, and on top of that, make sure you only use it on a flat surface. Another good tip to keep in mind is to have a friend or family member out hanging lights with you. If you have no idea what you’re doing, it might not be a bad idea to just hire a professional to do the work for you. Make this holiday season a great one, and as you’re taking down your lights this year, inspect the condition of your current outdoor lighting situation. Could they use an upgrade? If so, shop Berlin outdoor lighting at Billow Lighting & Design. Simply stop by our Berlin lighting showroom to view our selection of light fixtures in person. While you’re here, you can also chat with a lighting expert so you can find lighting solutions that fit your style and your budget. Contact us today by calling (856) 281-1399 or by filling out our online form.